not work in Wine unless you have things set up in a specific way. PlayOnLinux is an implementation of the Wine which make it easy to install Windows software on Wine. How to Install Wine on Ubuntu 18.04. We will perform the following steps to Install PlayOnLinux on Ubuntu 18.04 Bionic Beaver. That's all we need to do. 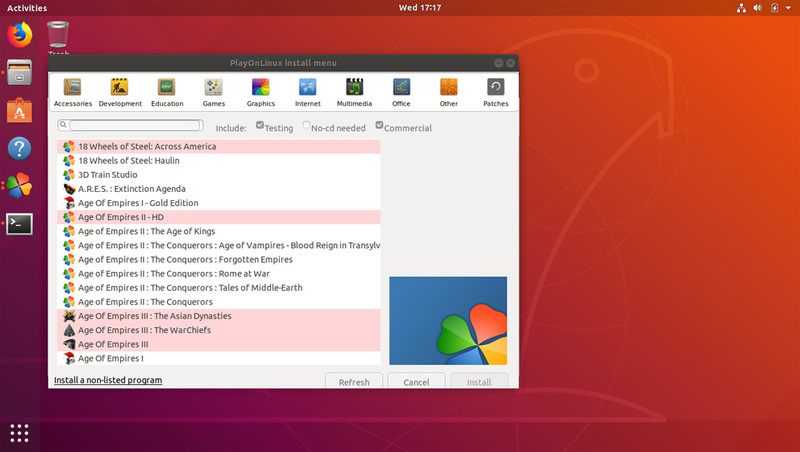 You can now go to Ubuntu application menu and open PlayOnLinux. Playonlinux is like a software center for Wine. There are many Windows software can be installed from PlayOnLinux directly (E.g. Microsoft Office, Photoshop and games such as Age of Empires 3), without having to download them separately.